At last, VSAN is launched. Over the coming weeks and months, I plan on doing a series of VSAN (or Virtual SAN to be more accurate) posts. 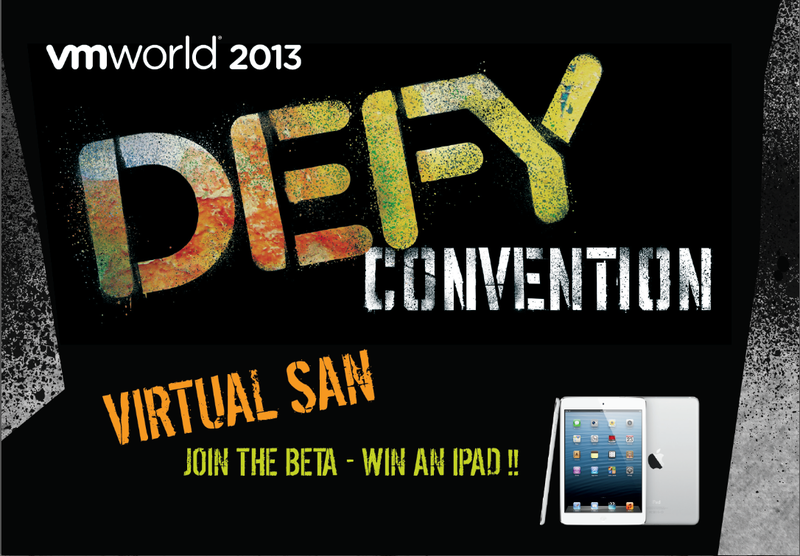 I will start with a brief introduction to the product which was announced at VMworld 2013 with a public beta. The first thing to understand is that the name is a bit of a misnomer. VSAN has got nothing to do with SAN in the traditional sense. Instead it leverages the local storage from a number of ESXi hosts which are part of a cluster. A distributed vsanDatastore is then created leveraging the local storage from each of the ESXi hosts. This can then be used for VM placement, and of course supports a range of core vSphere technologies like vMotion, DRS & vSphere HA. Virtual SAN is fully integrated with vSphere. It is an object based storage system and a platform for VM Storage Policies that aims to simplify virtual machine storage placement decisions for vSphere administrators. Its goal is to provides both high availability as well as scale-out storage functionality. It can also be thought of in the context of quality of service (QoS) in so far as VM Storage Policies can be created which defined the level of performance and availability required on a per virtual machine basis. VSAN can be though of as both a converged platform (of both compute and storage) as well as hybrid storage solution (since it leverages both SSDs and traditional spinning disks). The scale-out aspect is not to be overlooked. If you need additional storage, additional storage can be added to the hosts and automatically added to the vsanDatastore (which may be configured to increase its capacity on the fly). Should additional compute be needed, then it is simply a matter of dropping a new ESXi host into the cluster. Any storage on this new ESXi host may also be claimed by VSAN if configured to do so. Needless to say, this is something very exciting for us all here at VMware. While we have dipped our toes into the storage space in the past with the vSphere Storage Appliance (VSA), VSAN is a different product entirely. I build Virtual Server clusters using ASUS servers for my customers using VMware VSA. Will the Virtual SAN replace the VSA ? Will VMware keep the VSA as well or will it be dropped ? What are the performance advantages between the two. Price differences? VSA is part of ESS Plus. For now, we will continue to ship both products Peter. I’ll look to do a comparison blog post after VMworld. A great comparison. Thank you!. As VMware is throwing a SAN as part of VSA 5 for Essentials Plus customers, that they wont be doing the same with the Vsan. is that going to be a feature they add? He’s right – there is no dedupe in 1.0. I can’t comment on futures – sorry. 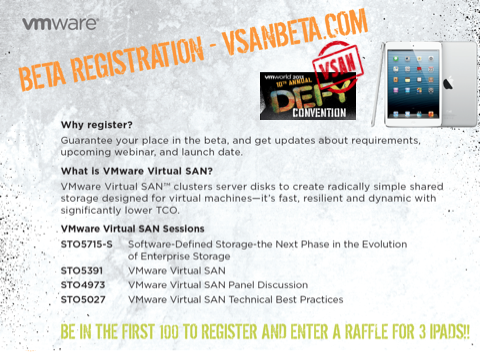 I wonder if the new VSAN feature different form Virsto Or its on the outputs for this acquisition.. ! Very much. VSAN is a new storage platform; Virsto on the other hand is an I/O accelerator product which deals with the ‘I/O blender’ problem caused by multiple VMs generating I/O to the same datastore and turning what could be sequential I/O into random I/O. Virsto reverses that. At this point in time, the Virsto technology is not embedded in VSAN, but this may change over time. Fantastic write up as always Cormac. I’m interested in seeing more side-by-side comparisons, especially as VSAN carves out part of the market. How does this work? If a host goes down so does its storage. So is the data replicated? How? Over its own Ethernet interface (gig / 10gbe)? Say you have 2TB across 4 hosts. How much storage do you really have? I imagine some would be lost for a parity like raid in case a host goes down. But how many downed hosts can vsan survive? This sounds very interesting and I’d love to learn more! If this new technology is leveraging the locally attached disks to form a virtual SAN , with built in capabilities within the hypervisor itself. Does this implies “bye-bye” to the traditional SAN volumes? I don’t believe so. In fact, there are several other products and projects going on at VMware such as VVOLs and vSphere Flash Read Cache which are focused on SAN and NAS storage. Hi – Im a bit confused. Should I download Esxi/ vCenter ISOs that are linked on the vSAN public beta page, or is vSAN included in regular 5.5 Esxi/vCenter download ?